You are here: Home / Fun Outdoors / Travel / Baby Jogger City Tour – Can I take it on the plane? One of the features that makes the Baby Jogger City Tour attractive to parents is the compact fold. It is a lightweight stroller, making it perfect for travel. Apparently the City Tour pushchair fits in overhead bins on planes. I went to Newcastle International Airport to discover exactly which airlines would allow this stroller to go on the plane as carry-on in the locker above your head. Can I take the Baby Jogger City Tour pushchair on the plane? It fits into its own backpack carry bag, and it meets the carry-on requirements for many airlines. I took my toddler to the airport to find out the airlines you will be able to take this stroller on as hand luggage. Click here for a full review of the Baby Jogger City Tour. 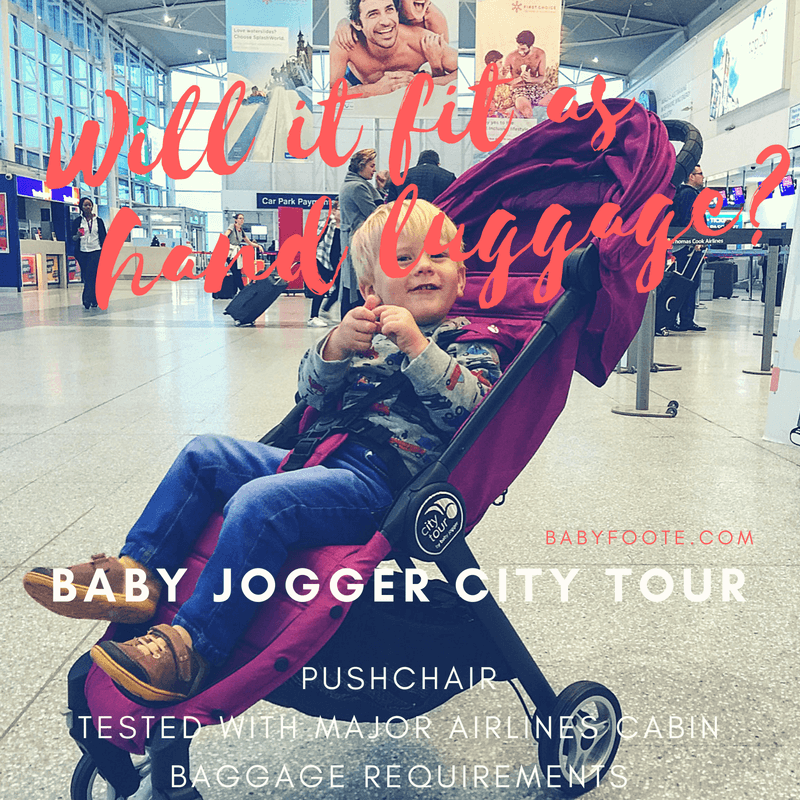 Can I take the Baby Jogger City Tour on an EasyJet flight as hand luggage? EasyJet Plus passengers can take one cabin bag measuring 56x45x25cm and one small under seat bag. The City Tour would be your larger carry on bag. 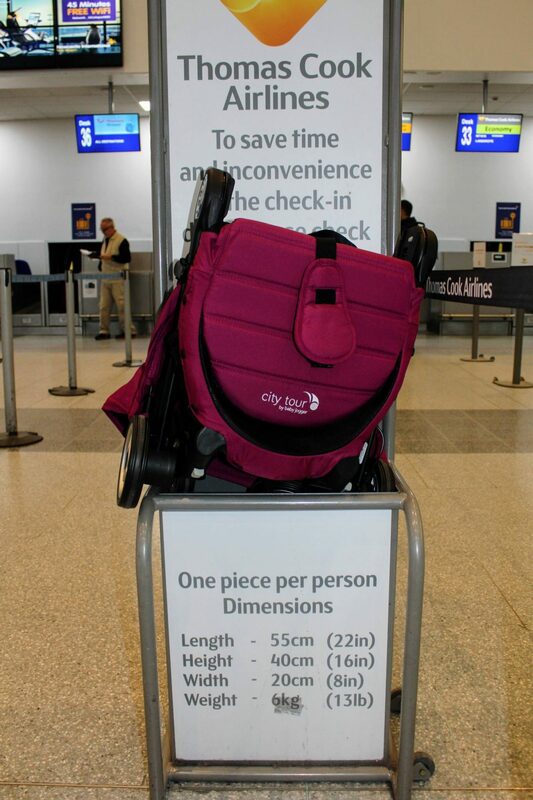 All other EasyJet customers can take one bag meeting those dimensions, although they do state that on busy flights it might need to travel in the hold. 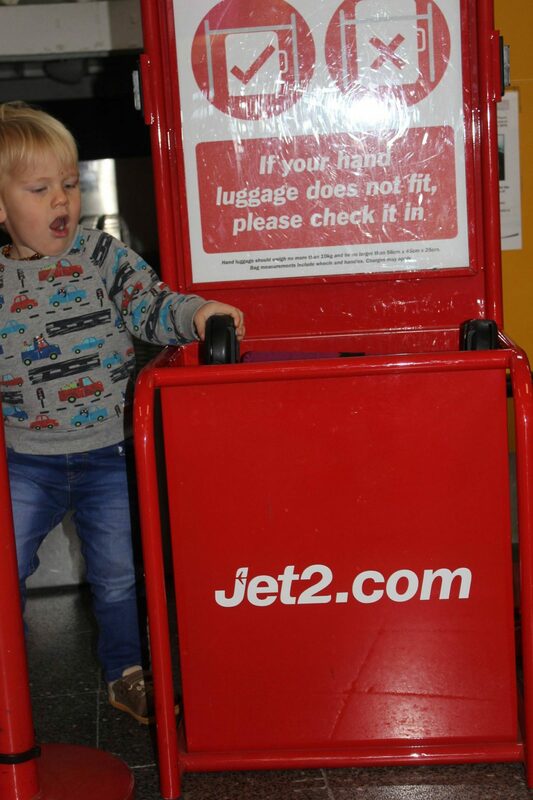 Can I take Baby Jogger City Tour stroller on a Jet2 flight as hand luggage? The wheels just stick out of the container. You might be alright, because the actual dimensions of hand luggage requirements for Jet2 are the same as EasyJet, above, at 56x45x25cm but the wheels were not entirely contained in the test environment. Be prepared either way, just in case. Can I take a Baby Jogger City Tour pushchair on a KLM / AirFrance flight as carry on? On KLM and AirFrance planes the City Tour meets the size and weight requirements as a piece of hand luggage. 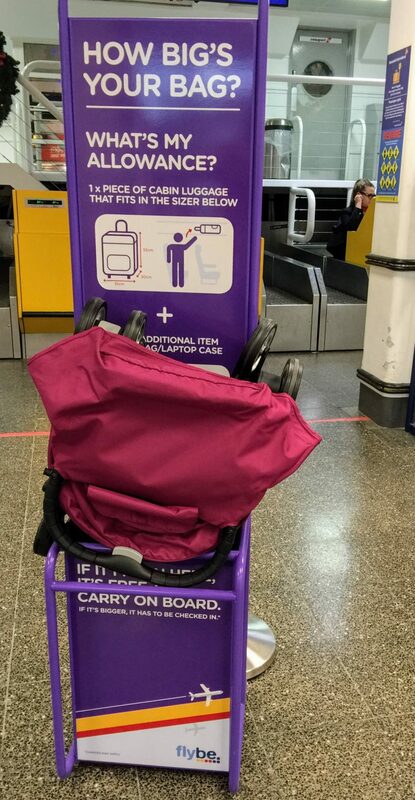 Will FlyBe let me take a Baby Jogger City Tour stroller on as hand luggage? You will not be able to take your City Tour on a FlyBe flight as carry on; it will have to go in the hold. The hand luggage requirements are 50x35x20cm, and this stroller doesn’t fit. Can I take a City Tour pushchair on an Emirates flight as a cabin bag? Emirates don’t have a tester box for hand luggage but I asked at the Emirates desk at the airport, where I was told the City Tour would be allowed as carry on. Will I be able to take my City Tour stroller on a CityWing flight as carry on? The handle and wheels do not fit in the box, and so won’t fit on a citywing flight as hand luggage. Also, although the pushchair is really light at 6.4kg, it is just over the 6kg limit on this airline’s carry-on requirements. Expect to check the stroller in. Can I take the City Tour pushchair on a Ryanair flight as hand luggage? Try as he might, my toddler couldn’t squeeze the stroller in the box. You should expect to check in the Baby Jogger City Tour on a Ryanair flight. Will a City Tour stroller fit on a Thomas Cook flight as hand luggage? The Baby Jogger City Tour doesn’t meet the cabin bag requirements of Thomas Cook. You will probably be asked to hand the stroller over to be placed in the hold. Can I take a City Tour stroller on a BA or AA flight as hand luggage? The Baby Jogger City Tour meets the cabin bag requirements for British Airways. Be aware that BA reserve the right to move any hand luggage into the hold on busy flights. 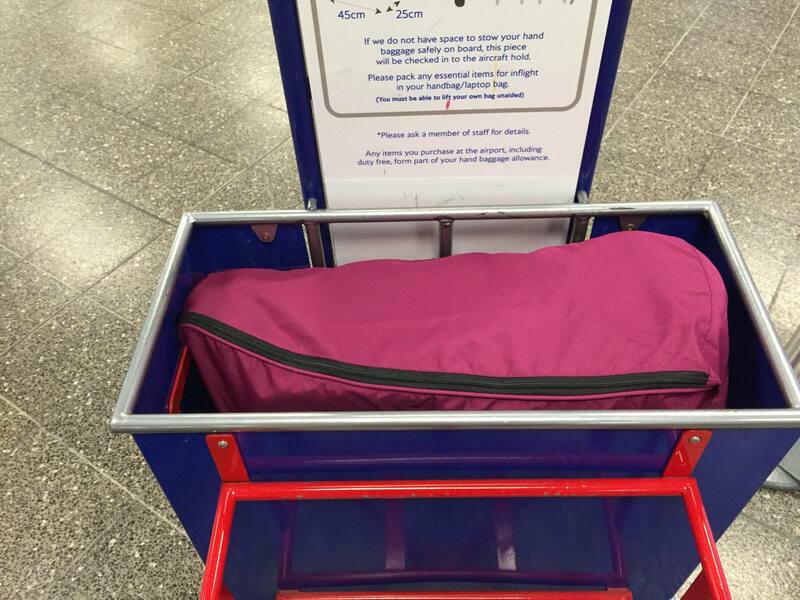 I wrote this post in December 2016, using cabin bag guides at Newcastle International Airport. Hand baggage requirements of airlines may change, and no responsibility or liability is accepted if you act on information given here. You should check the individual requirements of your airline before you travel. Also remember that on busy flights you may not be able to keep hand luggage in the cabin with you, even if you were allowed to take it on the plane. There may be no room in the overhead bins and the flight crew may remove it and place it in the hold. Do you have the Baby Jogger City Tour? Do you plan to take this compact stroller on a flight? Let me know how it went if you have taken your City Tour pushchair on holiday! We have the City Tour as well. This is such a handy indicator of the differences in what hand luggage equates to. Great feature! Thanks! My son thought it was hilarious testing each box; “No, that one not fit, no!” Hope it’s useful. I need one of these!! I can’t even fit my own buggy in the boot! I can totally relate; this is a life changing buggy. Now I can actually put the shopping and the pushchair in the boot, AND carry a passenger in the car!! 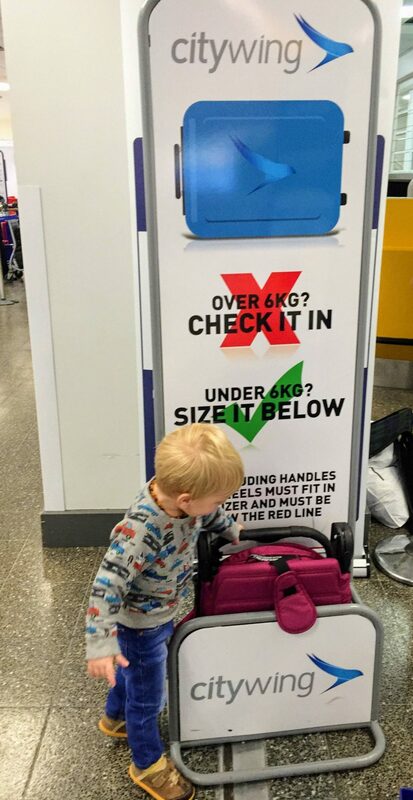 I think there is an advantage to knowing your pushchair is with you in the overhead locker – it’s not going to be damaged and it is there to use as soon as you step off the plane. Thank you for very useful summery. We just bought city tour, but as far as we tried, you can remove all 4 wheels and it could fit maybe in the measures of some companies as it became 51x40x18. Will try in a 2 days how it fits in Rayanair box without wheels. That’s really interesting information! I’d love it if you could come back and tell me how it goes, please. Hi! Did you test it with Ryanair? How did it go? This is so helpful! Can you remove the wheels to fit it in Thomas cook overhead? Yes, I believe you can. The instructions say you can remove the wheels quite easily. I don’t know how much you’d benefit from having it in an overhead locker on a Thomas Cook flight if you took the wheels off, though? The Baby Jogger City Tour wouldn’t be useable straight off the plane in such a scenario? Let me know how you get on if you try it. Did you try it with thomson’s? I was hoping to take it with them but I’m unsure it will fit. No, I didn’t, it doesn’t look like it anyway! Sorry. I’m sure you will be able to take it to the gate with you and have it soon after the plane lands. 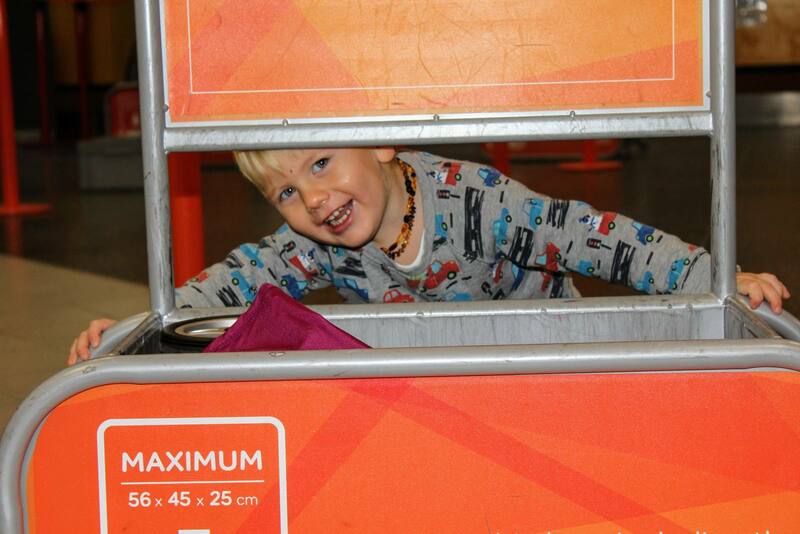 Let us know if you are able to take Baby Jogger City Tour in the overhead locker with you! Excellent guide! I too am interested in how it went with Thomas Cook airlines. I have heard several people who got to take it with them, but I wonder if it fits the measurements if you remove the Wheels? I’m not sure what benefit there is to taking a stroller on the plane with you, if you have to reconstruct it before use? Otherwise you might as well have it travel in the hold and you get it when you come off the flight? In many situations they take the pushchairs off before disembarking the passengers so they’re ready for you when you go down the steps or out into the ramp. However, that being said, I’ll try to take the Baby Jogger to the airport to follow up on that idea with the Thomas Cook bin! 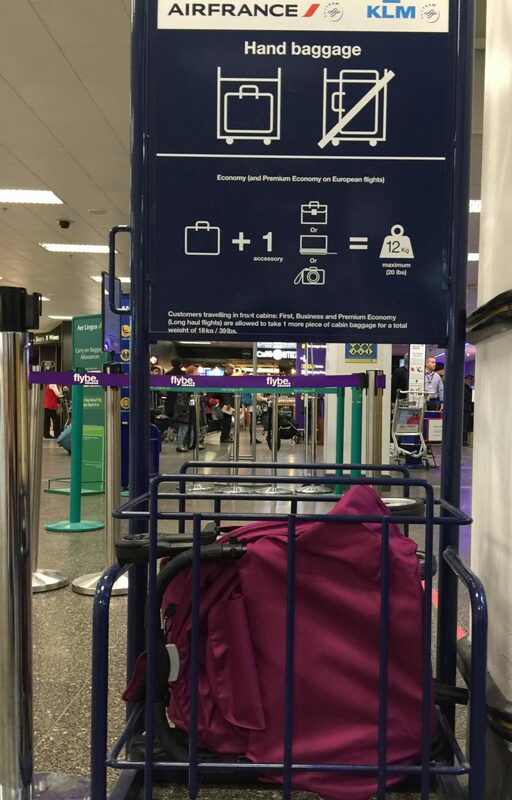 I live in Sweden, and everytime I have travelled I had to check the stroller (however lightweight) in at the Special Luggage directly arriving at the airport, hoping to locate a abandoned rental stroller. After the flight we pick up our bags at one place, the we have to walk acroass the AirPort to special luggage department to collect our stroller. Wich is being thrown down on a pile of other stroller from a platform from a bus outside. A total of 1, sometimes 2 hours extra time, if the stroller even survives. For me to be able to carry the stroller on board, then take two minutes to assemble the backwheels would save me a ton of time and backpains. Oh no Madeline, that doesn’t sound good! This little pushchair that can hide in a backpack might be ideal for you then. Hi thanks for this helpful article. I’m torn between the Babyzen yoyo and the city tour jogger. I love that the yoyo is guaranteed to get on flights anywhere but I have a tall toddler and I feel that his back is not supported enough so I’m inclined to get the city tour jogger so his back is more supported. 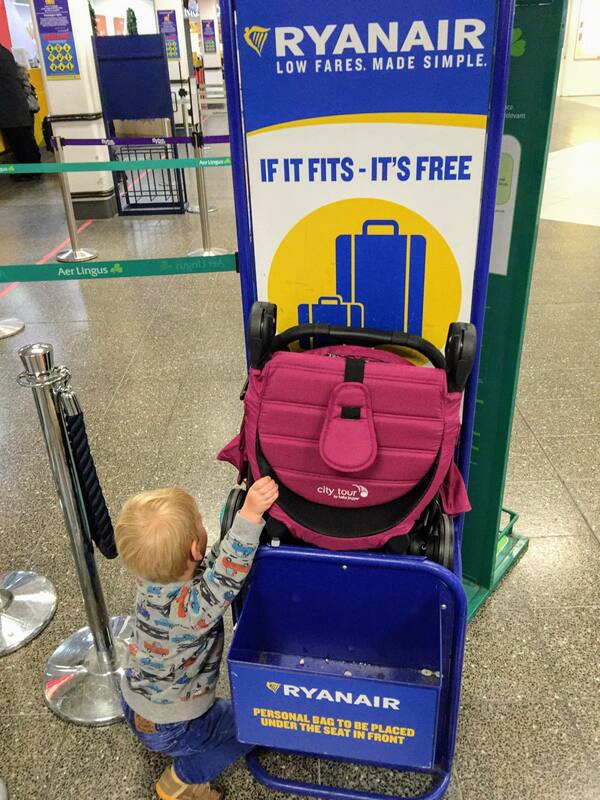 If you fly Ryanair (or any other budget airlines) can you still push the City Tour stroller all the way to the boarding gate and get it back at the gate when you land? Ryanair have changed their rules on cabin baggage recently so that only items smaller than 20x30cm can go in the overhead locker. Everything else has to go with you to the gate but will be taken from you just before you climb on the plane. So no liquids bigger than 100ml, etc. BUT you don’t get it back until the usual carousel after the plane has unloaded the hold. Could this change draw a question mark over the Yoyo too? We have taken the City Tour on Jet2 and Easyjet, and used it right to the gate and off the plane on the other side. 18 months on and it’s still going strong! Thanks for your reply! I was convinced I was going to get the city tour but I read earlier that it’s recommended for 6 months to approx 3 years or 15 kg! I have a tall 2.5 year old toddler who is almost 15 kg and I would like to get some mileage from this stroller for at least until he is 4 (unless he decides not to use it anymore). Not sure how old your little one is but is it really just up to 3 years old or 15 kg? If that’s the case then we’re in trouble! My 3 year old is tall and weighs 17kg on the nose. The baby jogger is surviving well. My 5 year old is 19kg and goes in it when he’s tired. When they’re both tired we have had both of them in and the pushchair is hard to shove down the street but it hasn’t broken yet. Another thing I like about the baby jogger city tour is that it’s all machine washable. Did you try to flight with SAS star alliance ? No, I didn’t, but I’ve had a quick look on their website and the hand luggage size is roughly the same as BA, a Star Alliance partner. I did test the Baby Jogger City Tour with BA.